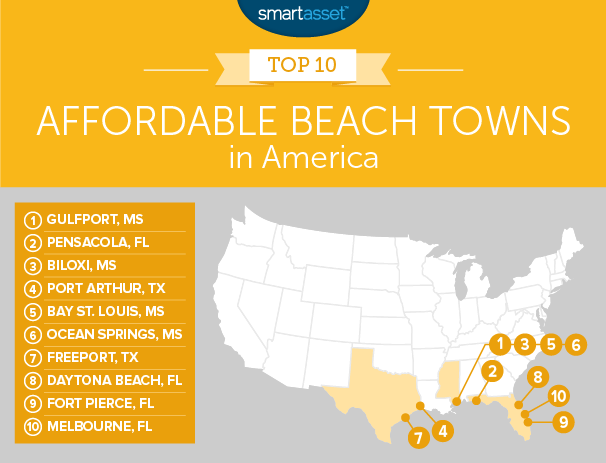 SmartAsset, a fintech company that offers personal finance advice, recently published its “Most Affordable Beach Towns” list, which named the top 10 towns where buyers can get white sand, beachfront views and temperate weather all without breaking the bank. 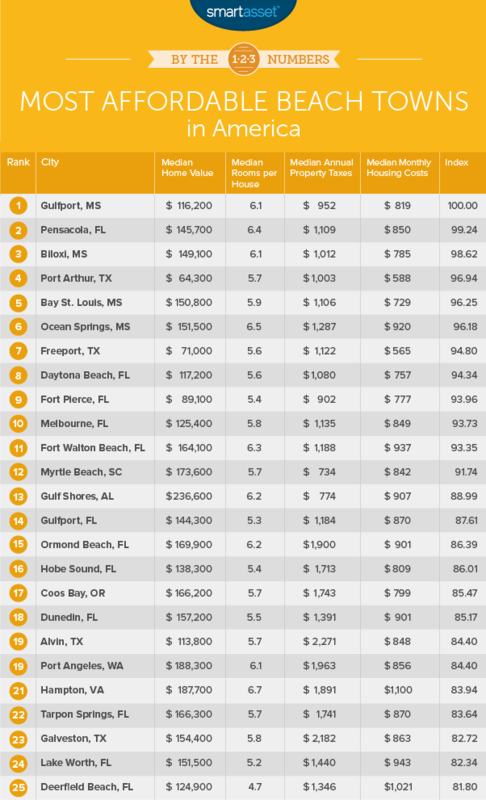 Gulfport, Mississippi nabbed the top spot for the third consecutive year, thanks to a median home sales price of $116,200 and affordable annual property taxes ($952) and monthly housing costs ($819). Furthermore, SmartAsset says Gulfport is one of the top cities to retire early in due to Mississippi’s 0 percent effective income tax rates and the lowest average non-housing cost of living. Pensacola, Florida and Biloxi, Mississippi maintained their no. 2 and no. 3 spots, respectively, from 2017; both cities have median home sales prices ranging from $145,000 to $149,000. Although Pensacola is about $30,000 more expensive than Gulfport, buyers will get more space (6.4 rooms versus 6.1) and Biloxi ranks better in median monthly housing costs ($785). Port Arthur, Texas and Bay St. Louis, Mississippi rounded out the top five with median home sales prices of $64,300 and $150,800, respectively. Although Port Arthur has the lowest median home sales price on the list, buyers should be aware of the costly annual property tax ($1,003) — much higher than the property tax in the top three cities. Meanwhile, homes in Bay St. Louis tend to be smaller with an average of 5.9 rooms, which might be a tight squeeze for a large family. The rest of the list remained largely unchanged from 2017, save newcomer Melbourne, Florida. The median home sales price in Melbourne is $125,400, and homeowners only spend, on average, $850 a month on housing costs. Score! See a list of the top 25 cities here. Home value. This is the median home value in each city. Data comes from the Census Bureau’s 2016 5-Year American Community Survey. Number of rooms. This is the average number of rooms per house. Data comes from the Census Bureau’s 2016 5-Year American Community Survey. Property taxes. This is the median property taxes paid. Data comes from the Census Bureau’s 2016 5-Year American Community Survey. Monthly housing costs. This is the median monthly housing costs. Data comes from the Census Bureau’s 2016 5-Year American Community Survey. We ranked each city in each metric. Then we found each city’s average ranking, giving the number of rooms a half weighting and all other factors a full weighting. Using this average ranking, we created our final score.